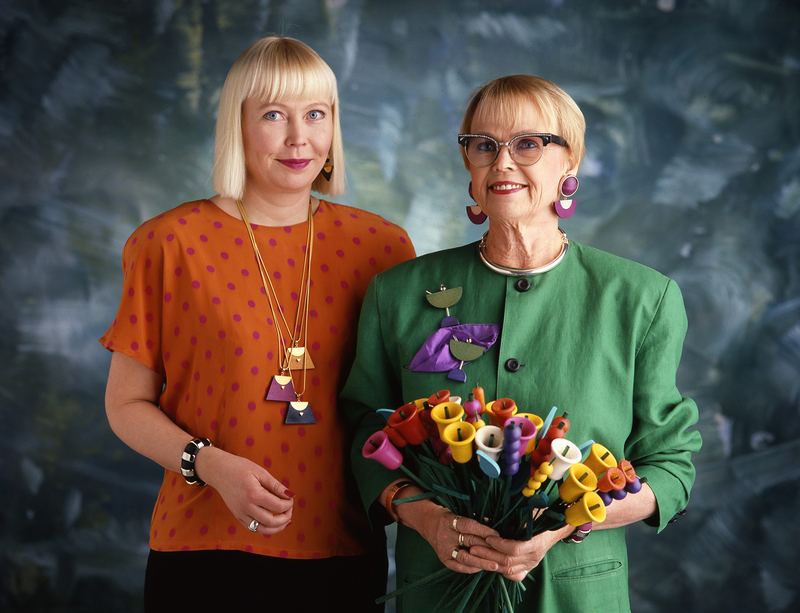 Pauliina and Kaija with the bouquet of wooden flowers that became the hit of the 1990s. 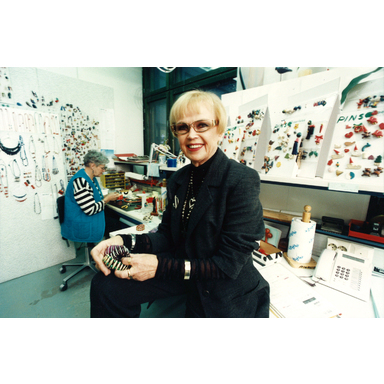 Kaija Aarikka and Else Liukkonen in the jewellery studio in the 1990s. 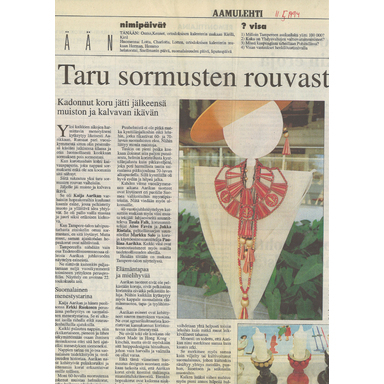 Talouselämä newspaper, 4 March 1994. 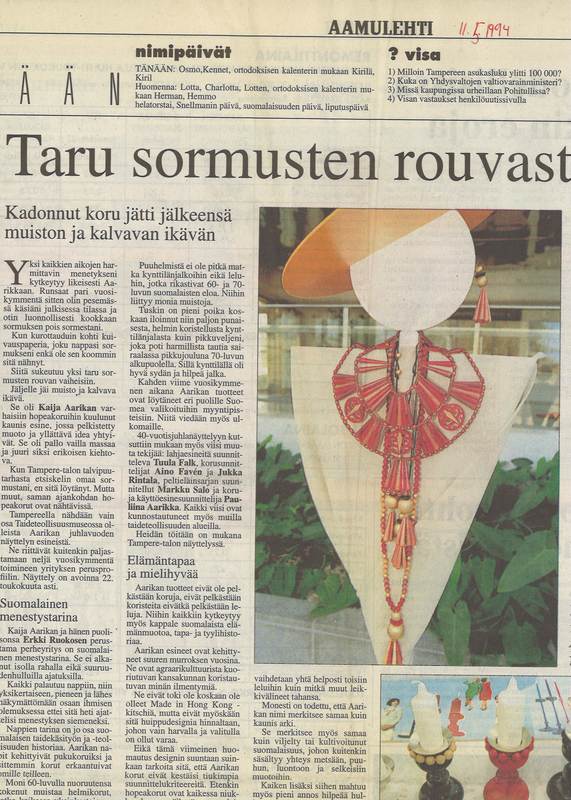 Etelä-Saimaa newspaper, 9 August 1998. 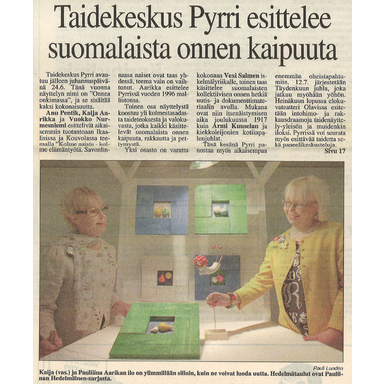 An article in Me Naiset magazine during the 40-year exhibition. 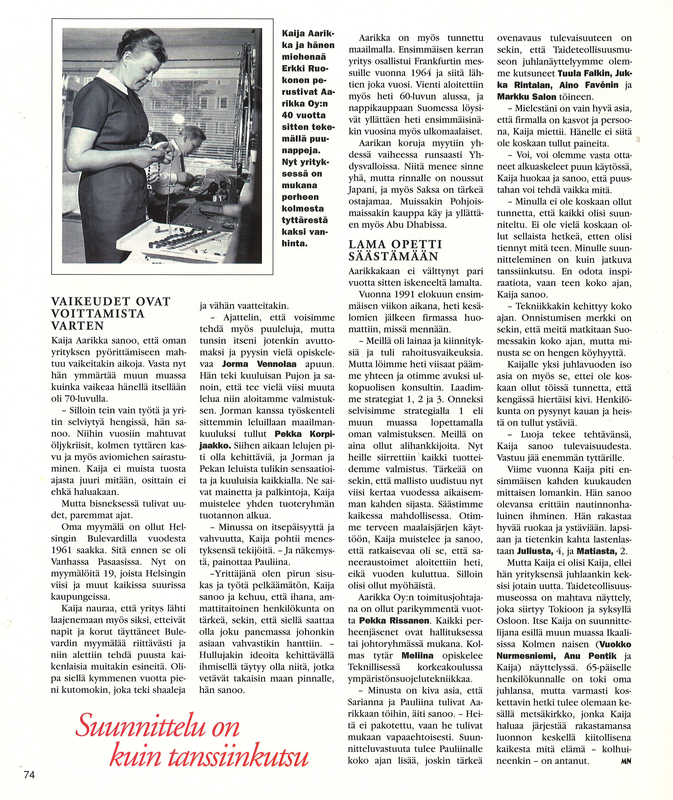 An article in Me Naiset magazine during the 40-year exhibition, part 2. 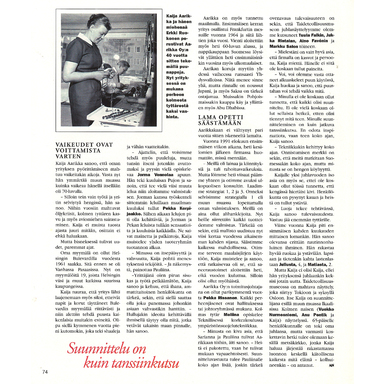 An article in Me Naiset magazine during the 40-year exhibition, part 3. 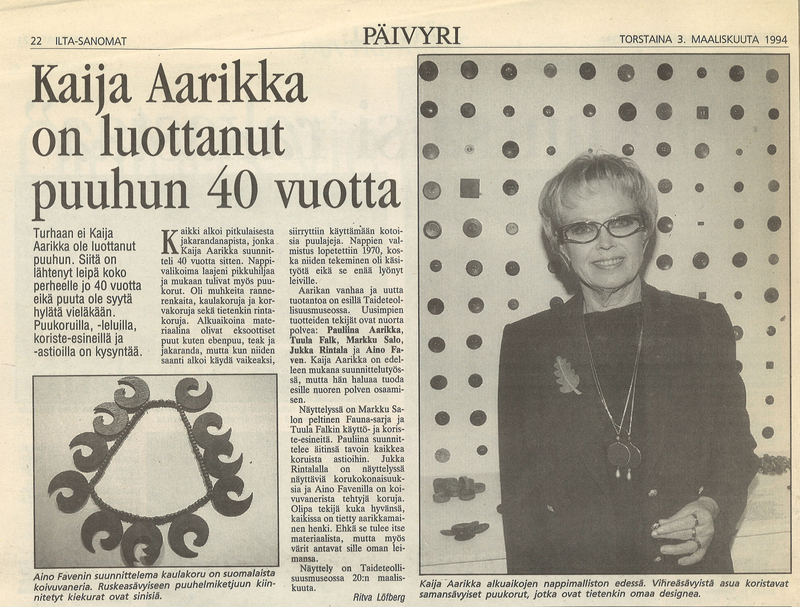 Kaija in Aarikka’s entrance hall in the 1990s. 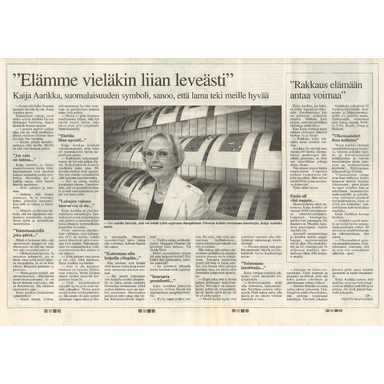 Pauliina in the newspaper Etelä-Suomen Sanomat, 9 September 1990. 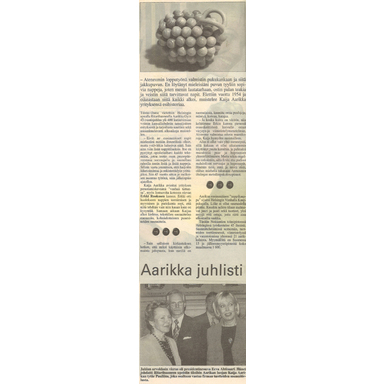 With the economic depression of the early 1990s, Aarikka was one of the many companies that faced a need to check their course, as operations had expanded too much during the exciting years of the economic boom. The company shifted from producing products itself to subcontracting their creation, and 10 shops were sold for franchise operations. The rapidly implemented new strategy enabled Aarikka to turn its operations around, and it was profitable again within just over a year. Amidst the continuing depression in Finland, Kaija Aarikka publicly called for joy and passion in people’s work, and she was lauded for her work from many directions. She was awarded the Pro Finlandia medal and the honorary titles Commercial Counsellor and Marketplace Counsellor of Somerniemi. 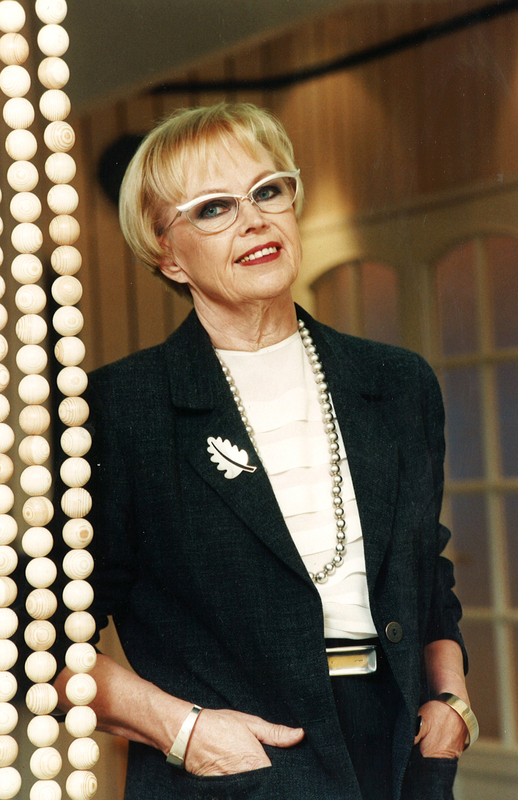 Pauliina Aarikka began to take greater charge of design issues. 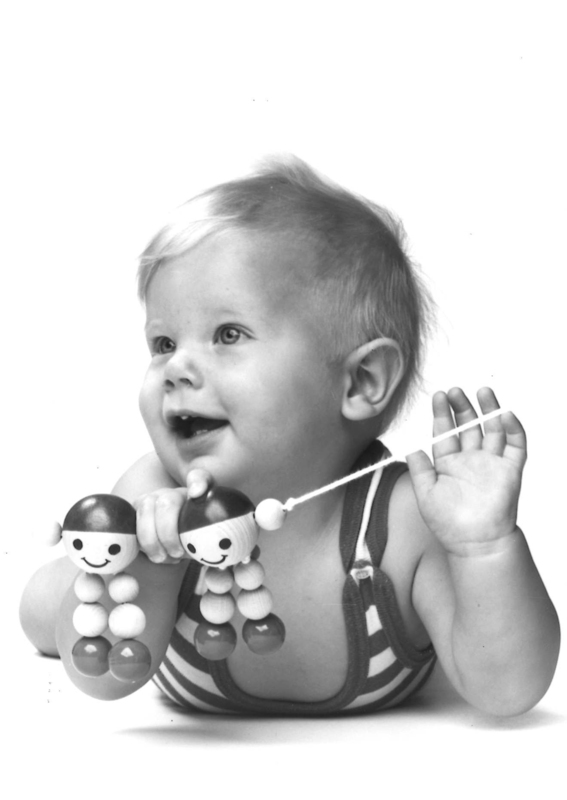 All of the company’s production was still in Finland, with this including 40 people working from home. 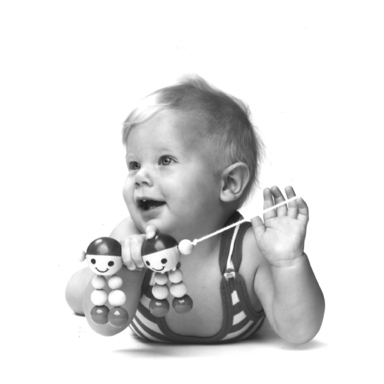 Colouring operations included, there were 600 products under production in these years. 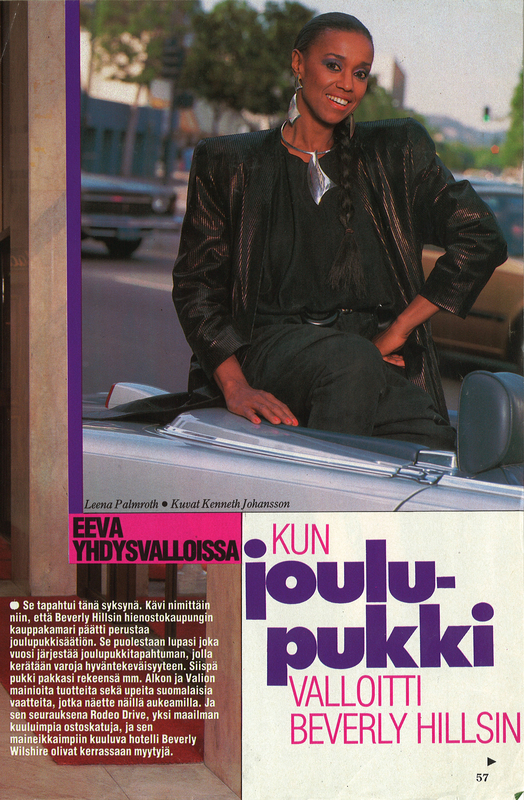 Pauliina in Avotakka magazine, January 1999 issue. 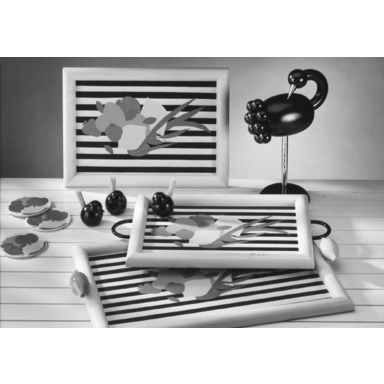 A picture and trays with a fruit theme. 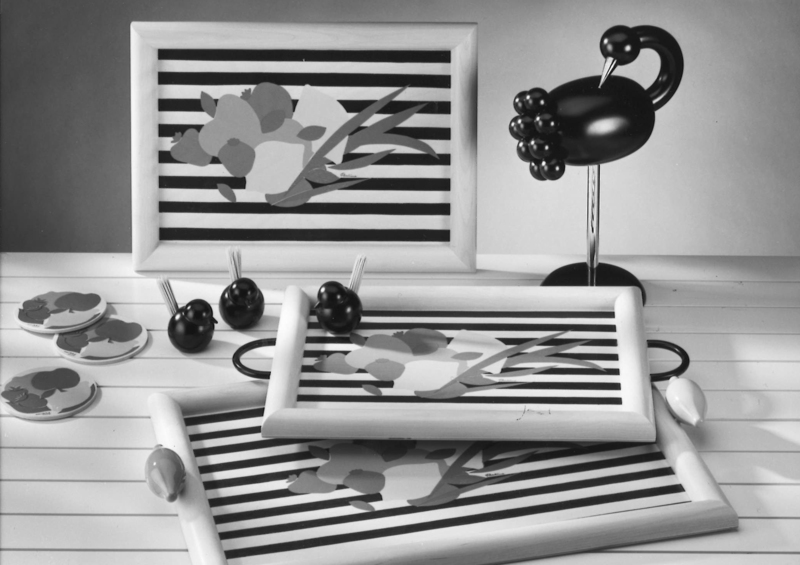 Products in the Allu series from 1998. Products in the Marina and Kotimaa product families from 1996. New items were demanded in the shops constantly, and the decision was made to create nine product lines a year, instead of the previous four. 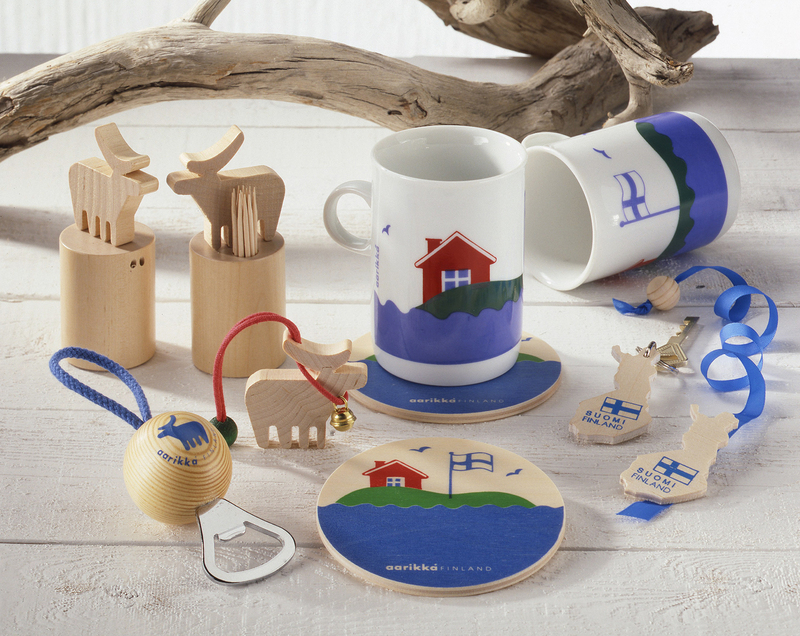 At Aarikka, people believe in thinking about sets of products rather than individual items, and the 1990s saw product families designed especially for gardeners, seamen, and people who love visiting the sauna. 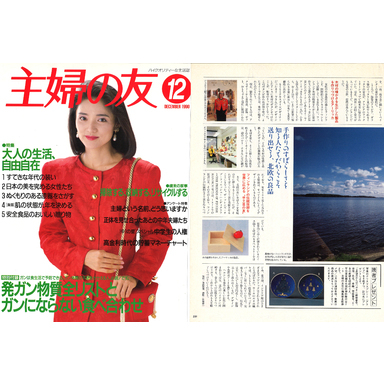 In the 1990s, people wanted to see colour, fun, and humour also in utility articles. The times called also for products that would suit the thinner wallets of the times. Long-stemmed wooden reeds and flowers designed by Kaija went well with the spirit of the age. Even the tiny Tikkutiainen ornament became a hit. 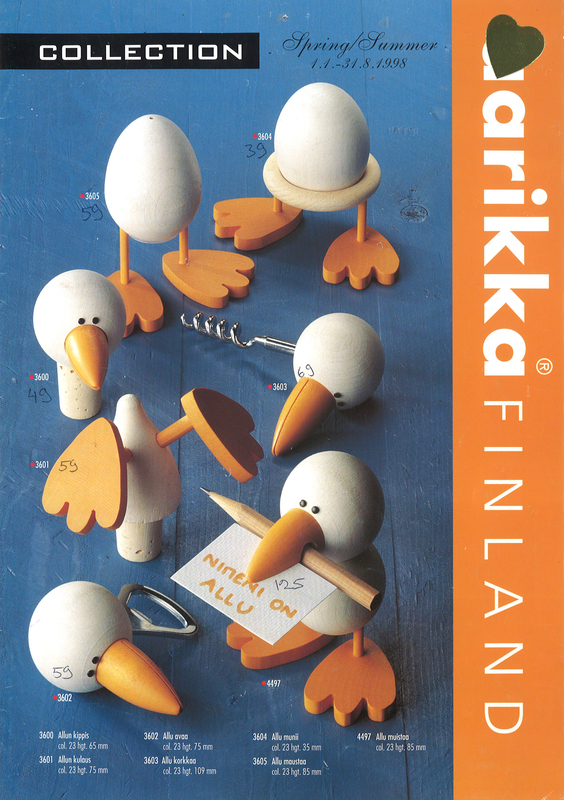 The Allu series, based on a playful duck character, received its own crowd of fans. 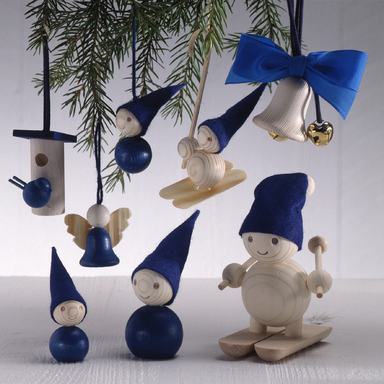 In addition to the wooden figures, Allu found adventure among Aarikka’s textiles and products used in table settings. 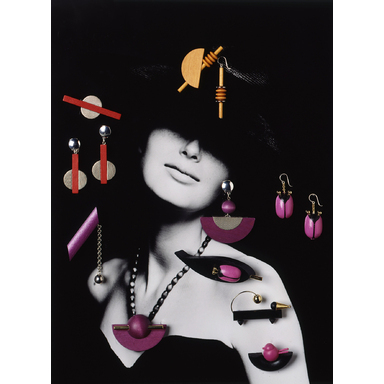 Dramatic jewellery trends from the early 1990s. 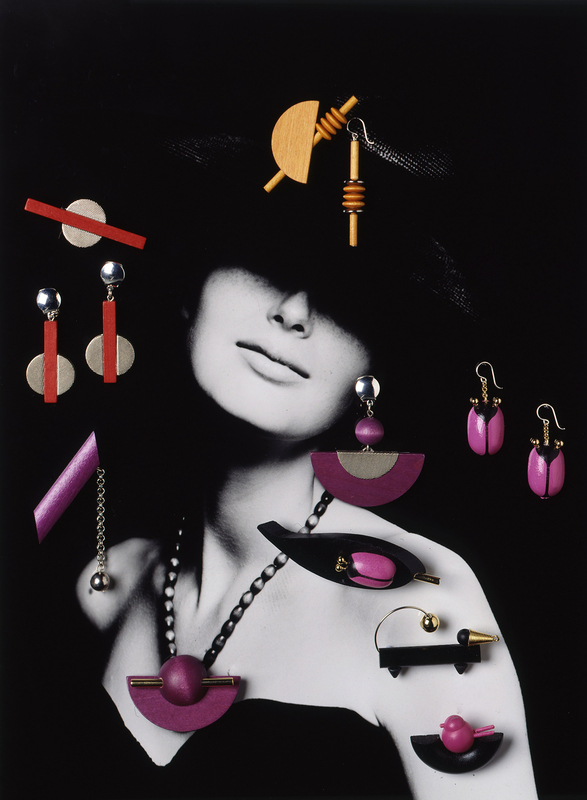 Colourful Piazza jewellery from 1996. 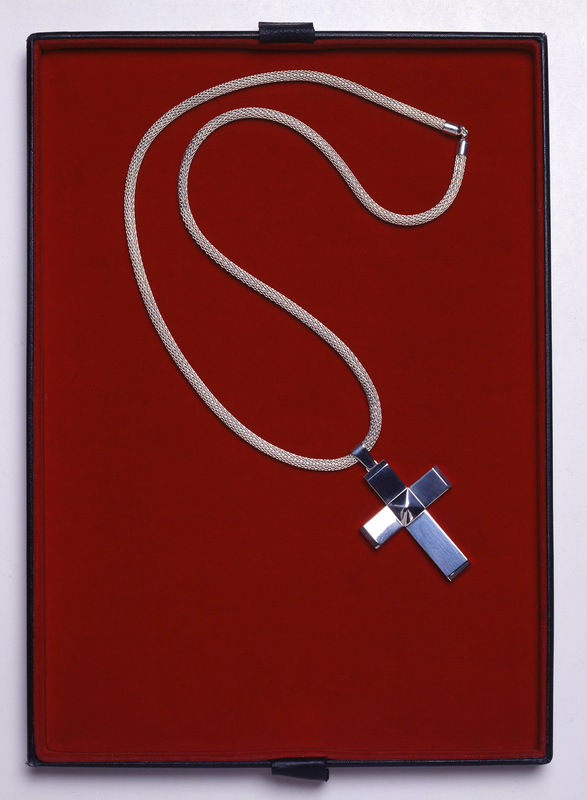 The Vanessa necklace from 1999. 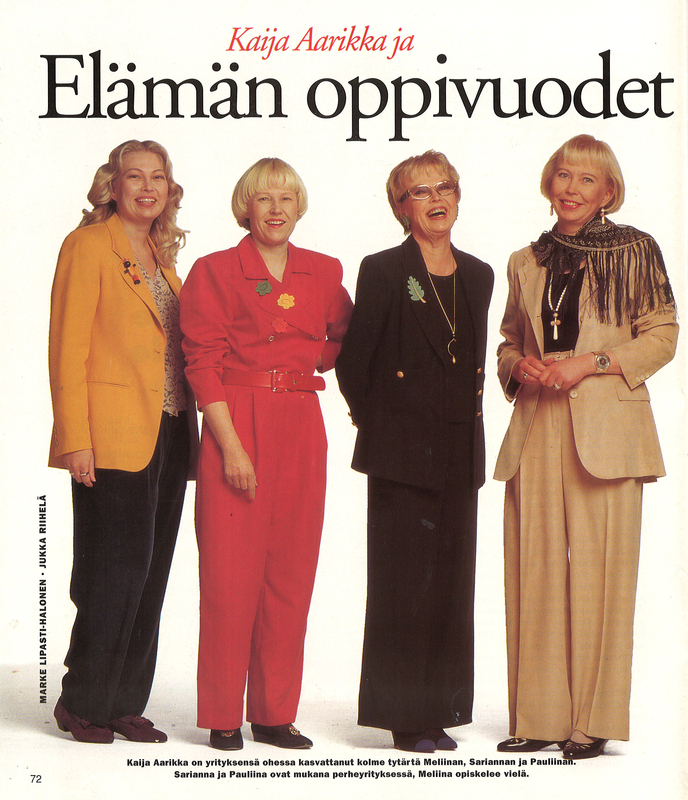 The magazine Kello- ja kultasepänala, issue 1/1999. 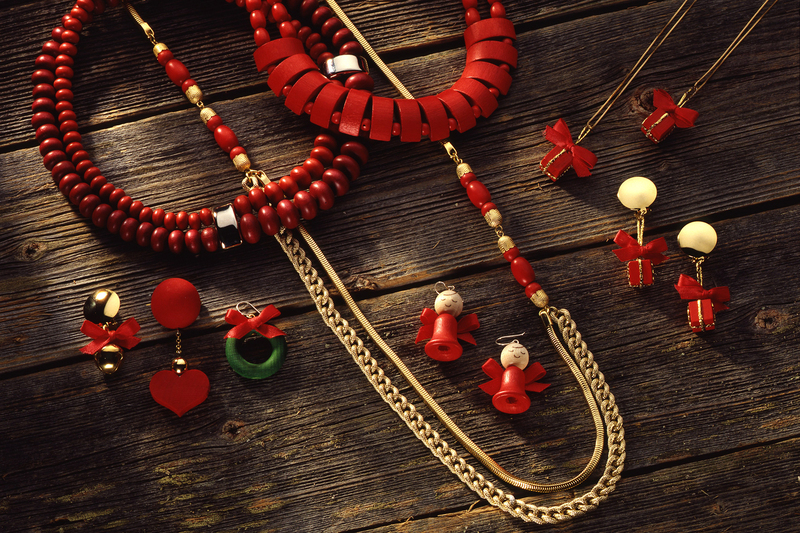 Pieces from the Christmas jewellery collections of the 1990s. 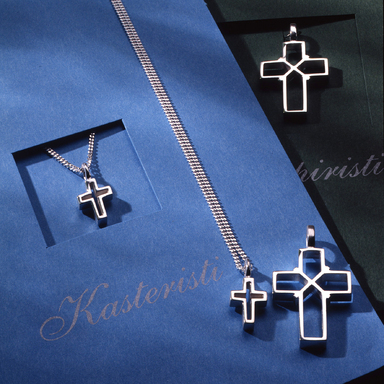 Silver cross pendants for the Finnish Evangelical Lutheran Mission. 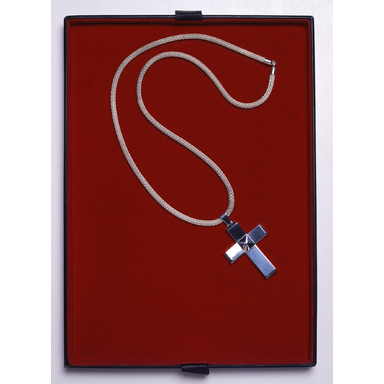 The Namibian bishop’s cross designed by Kaija. 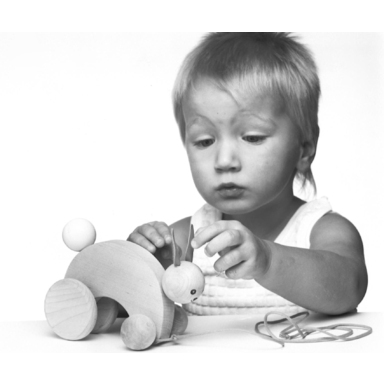 Wooden jewellery made a comeback in the 1990s. Wooden jewellery became highly appreciated. 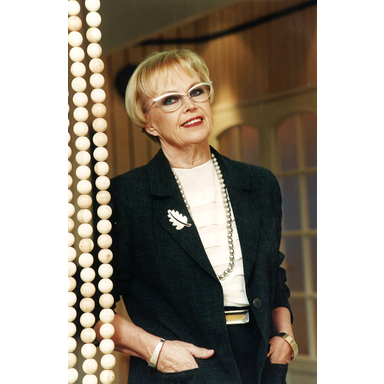 In an article in Me Naiset in 1994, Pauliina told the magazine that even makers of traditional rhinestone jewellery at a trade fair in Milan were very excited about wooden jewellery. Finnish women were also discovering the use of larger, more impressive pieces of jewellery, and even larger earrings began to sell well. Fashion trends followed one after another at such a pace that Aarikka jewellery collections began to be modified four times a year. This kept Aarikka’s jewellery sales on the increase, even while the depression was hammering the clothing markets. Soon, jewellery accounted for half of Aarikka’s total sales. Silver jewellery still had an important role for Aarikka. 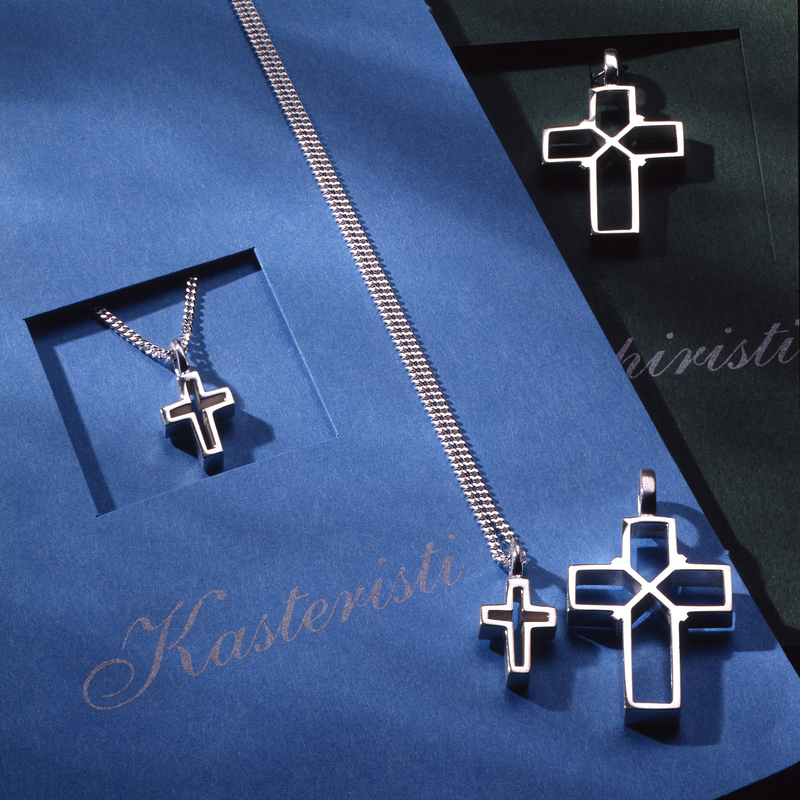 In addition to products for the company’s own use, Kaija designs baptismal and confirmation-cross pendants for the Finnish Evangelical Lutheran Mission and a bishop’s cross for the Church of Namibia. 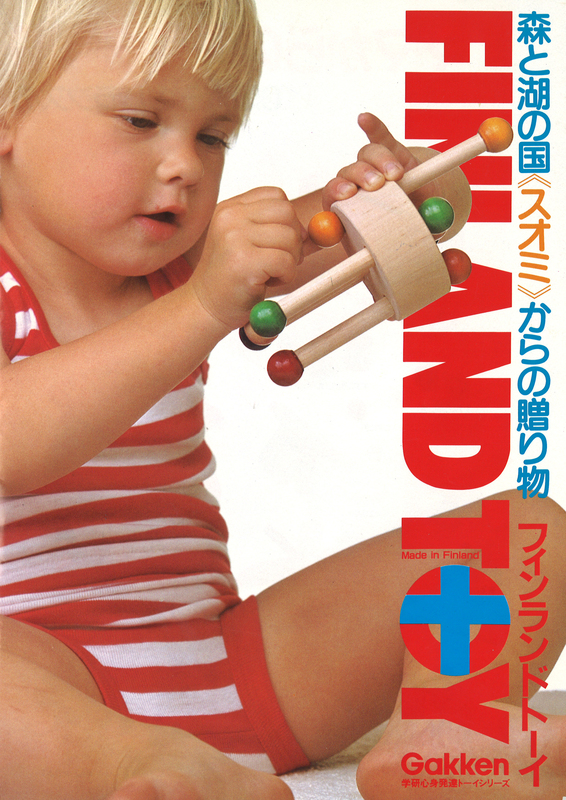 The cover of a toy brochure from the Japanese company Gakken, 1983. 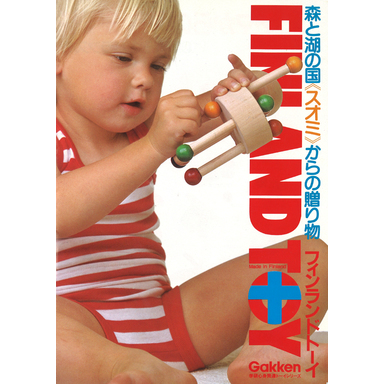 A brochure showing toys from Gakken, 1983. 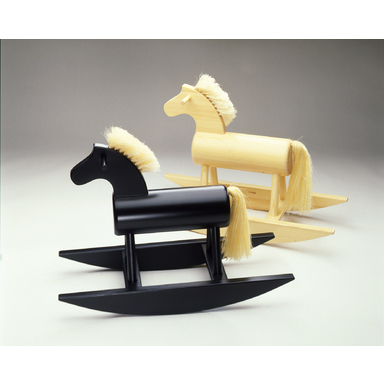 A rocking horse made from pine and natural fibres. 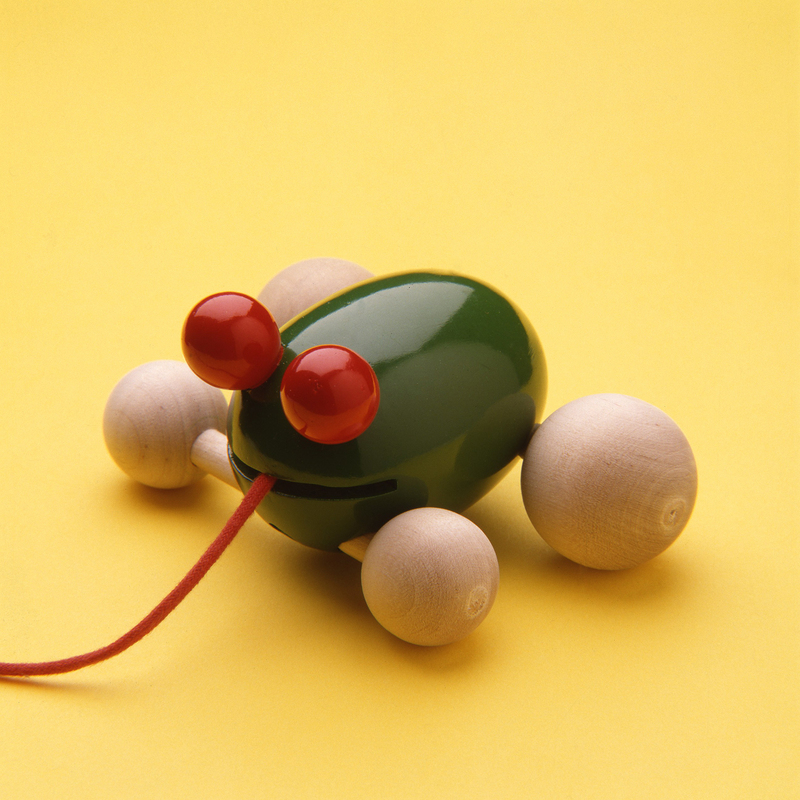 The frog tug toy Sammakko from the 1996 collection. The Muksut toy, shown here in its version from 1990. The bunny tug toy Jänöjussi, designed by Kaija Aarikka. 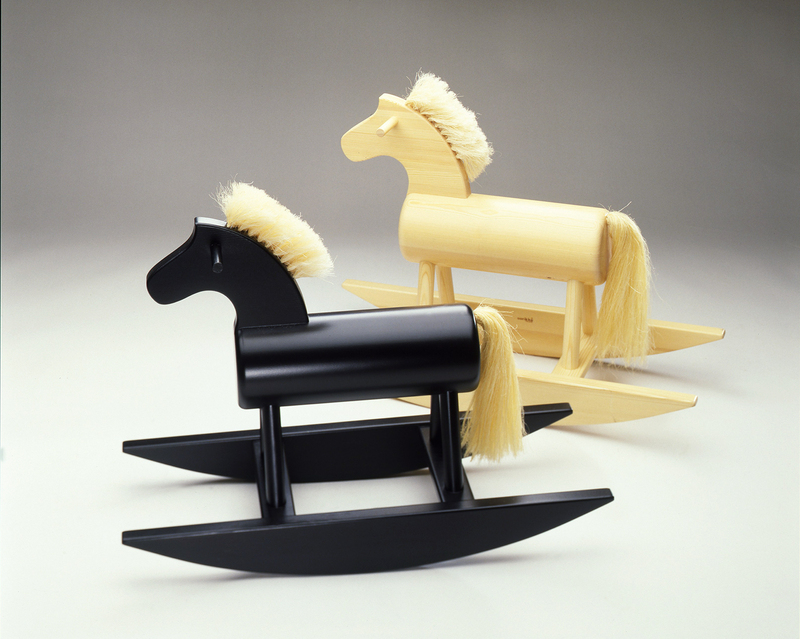 At the beginning of the decade, numerous toys crafted from wood were still in production, including a wooden rocking horse. 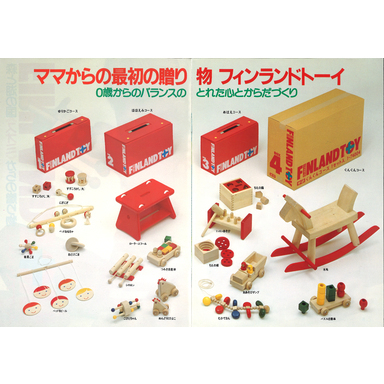 Toys were exported in large numbers to, for example, Japan, where a company called Gakken sold Aarikka toys with automatic delivery, applying a business model resembling that of book clubs. 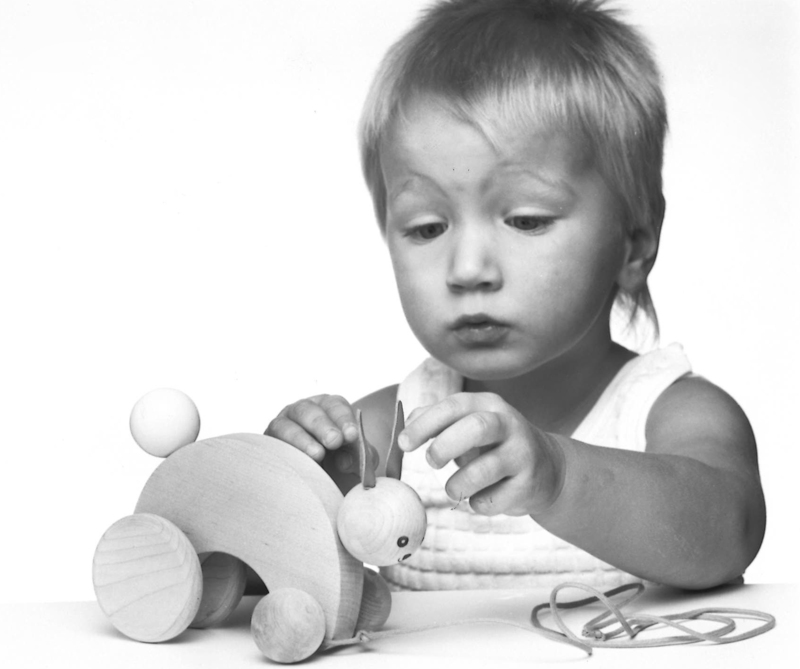 A child belonging to the toy club would receive regular deliveries of toys appropriate for his or her current stage of development. 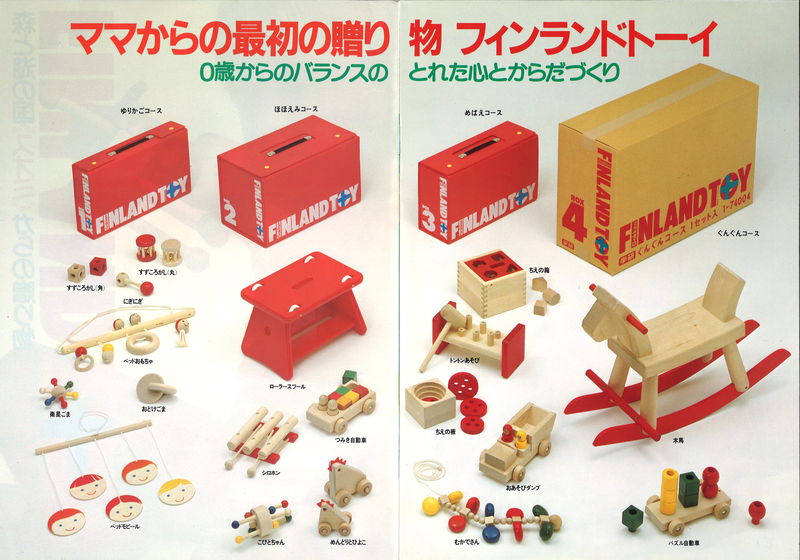 However, inexpensive imported toys and the introduction of one of the world’s strictest acts governing toys came to pose such great challenges for the manufacturing of classic toys that, little by little, Aarikka was forced to abandon the production of toys. Blue Christmas products for the German tastes of the time. 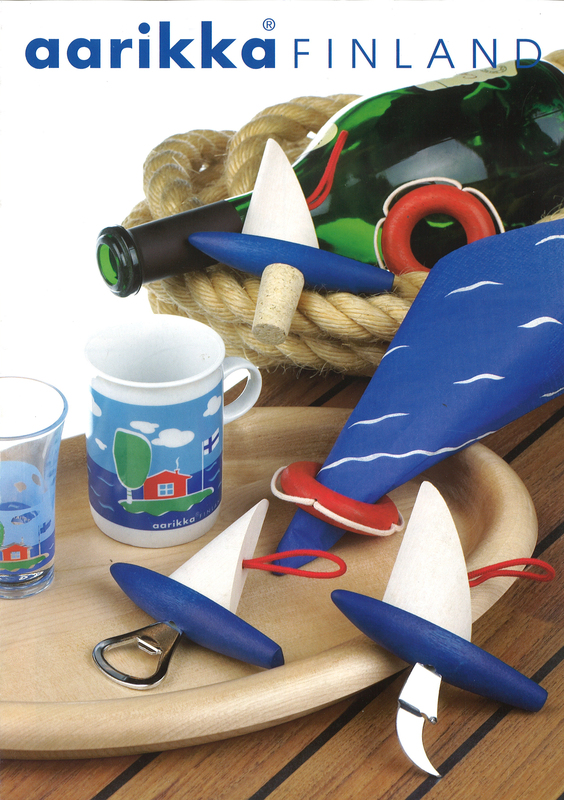 Products designed for tourists from early in the 1990s. 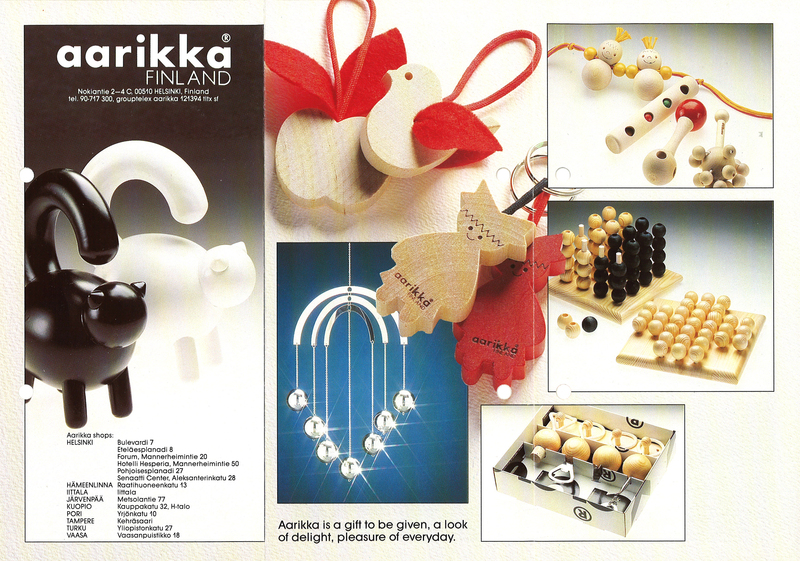 An article on Aarikka in a Japanese magazine, December 1990. 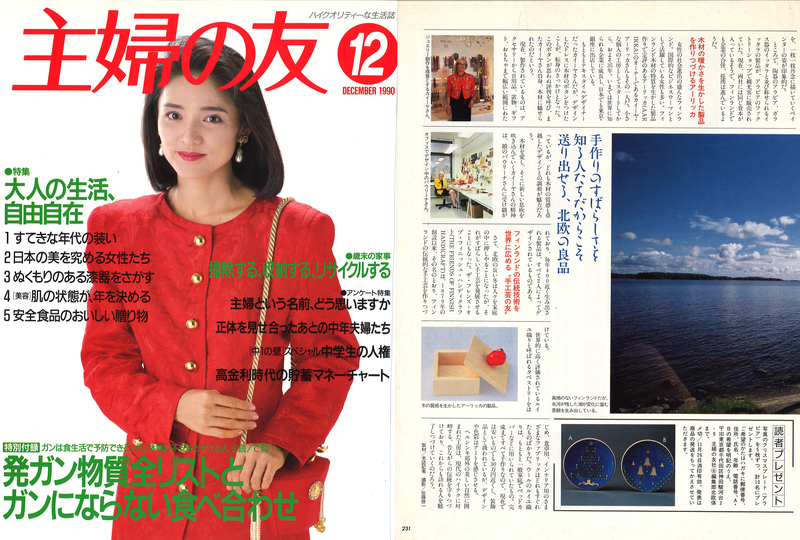 Pauliina appears in the Japanese publication Deux in 1991. Pauliina and His Imperial Highness Prince Takamado in the Esplanadi shop, 1990. 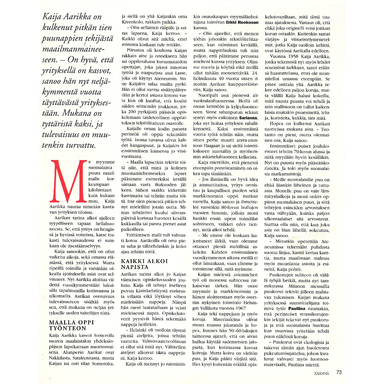 An article in Eeva magazine, part 1. 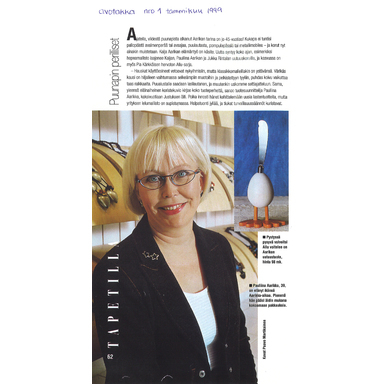 An article in Eeva magazine, part 2. 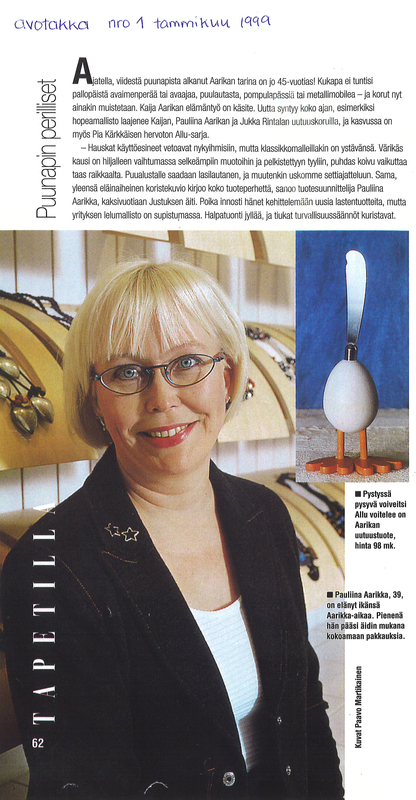 An article in Eeva magazine, part 3, on Aarikka’s Purje silver jewellery. 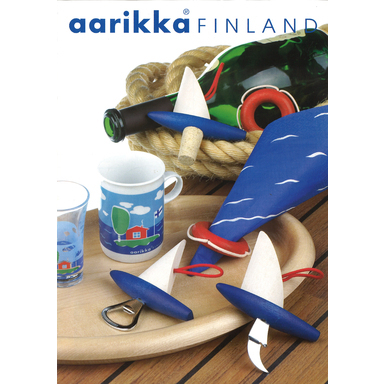 In these years, export accounted for 40% of the company’s turnover, a role ensured by Aarikka’s 1,600 retail locations, all over the world. During the summer, tourists were an important customer group. For their benefit, even the Christmas products were kept displayed in the shops all year round. 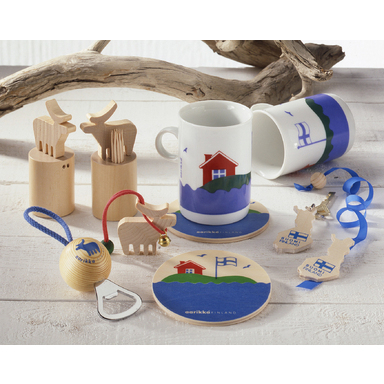 The company benefited too: sales of Christmas products formed 20% of the Aarikka’s entire turnover (30 million euros a year). Aarikka jewellery was sold as far away as Abu Dhabi. 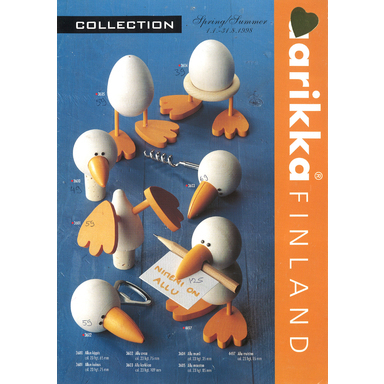 Sweden had always been an important export market for Aarikka products, and expansion into this market was ensured through new Aarikka shops at the Arlanda airport and in downtown Stockholm’s Galleria shopping centre. Germany was the company’s most important export destination, but Japan was not far behind in second place. In Tokyo’s upper-crust neighbourhood of Ginza, Aarikka established a joint shop with Annikki Karvinen. In Germany, the blue and white theme became such a smash hit that even the Christmas products entered production in blue for these customers. After this, the Germans wanted everything in red. 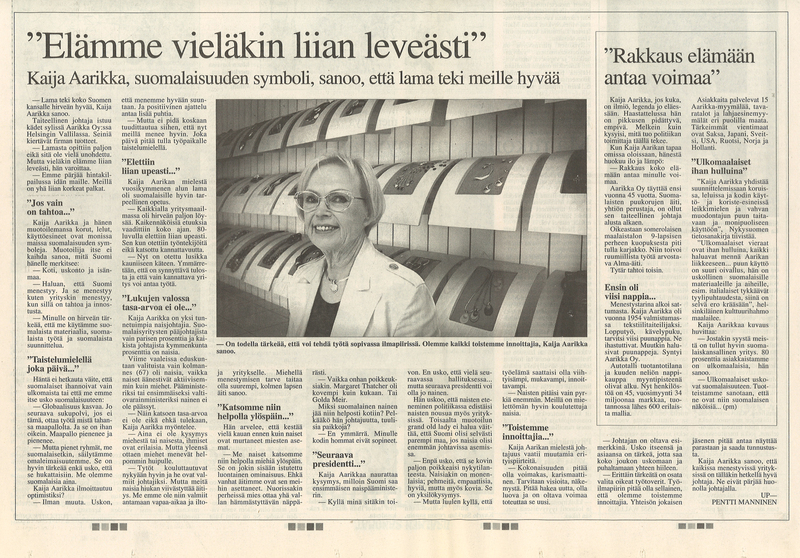 The 40-year exhibition as presented in Ilta-Sanomat, 3 March 1994. 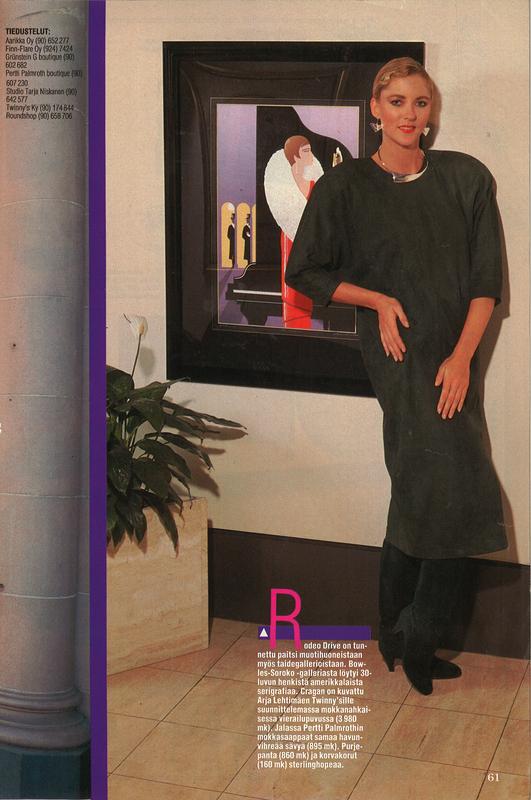 The 40-year exhibition as presented in Gloria magazine, 1994. A review of the 40-year jubilee exhibition. 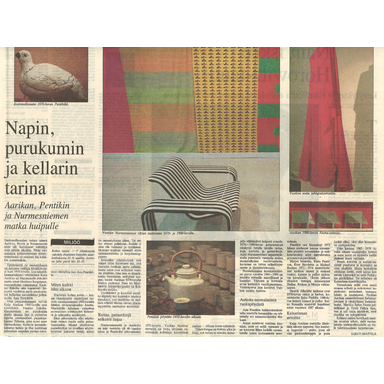 The exhibition held at Tampere Hall, as covered by Aamulehti on 11 May 1994. 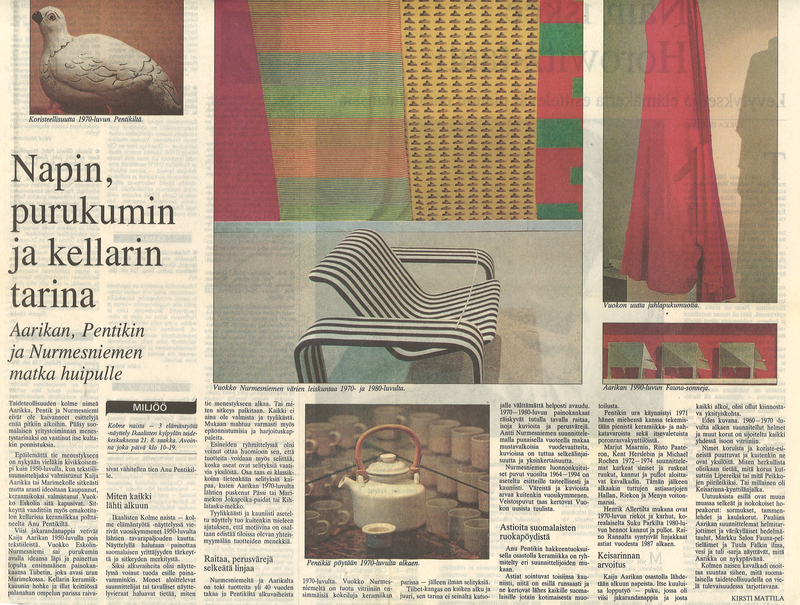 Helsingin Sanomat coverage of the ‘Kolme naista’ exhibition, 1994. 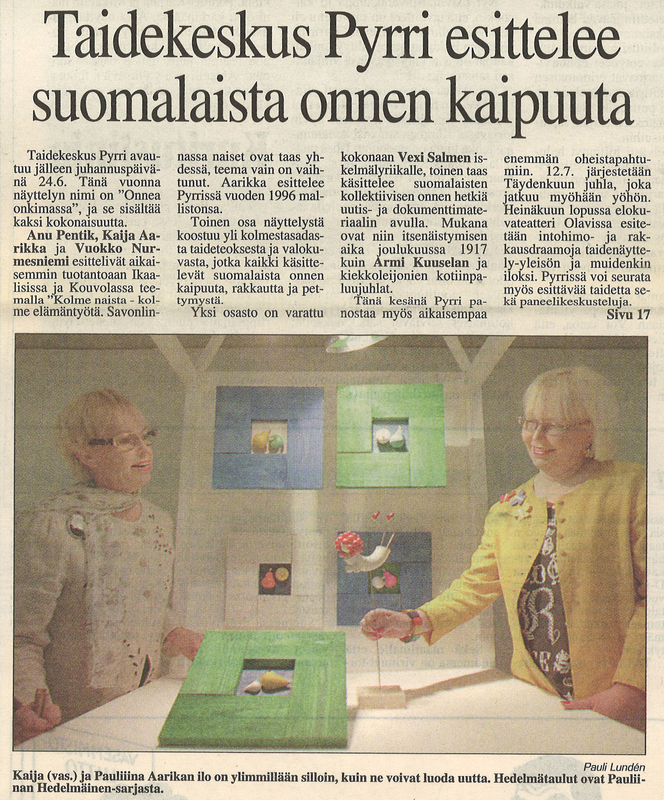 The Kolme naista exhibition described in the newspaper Ikaalinen, 1994. 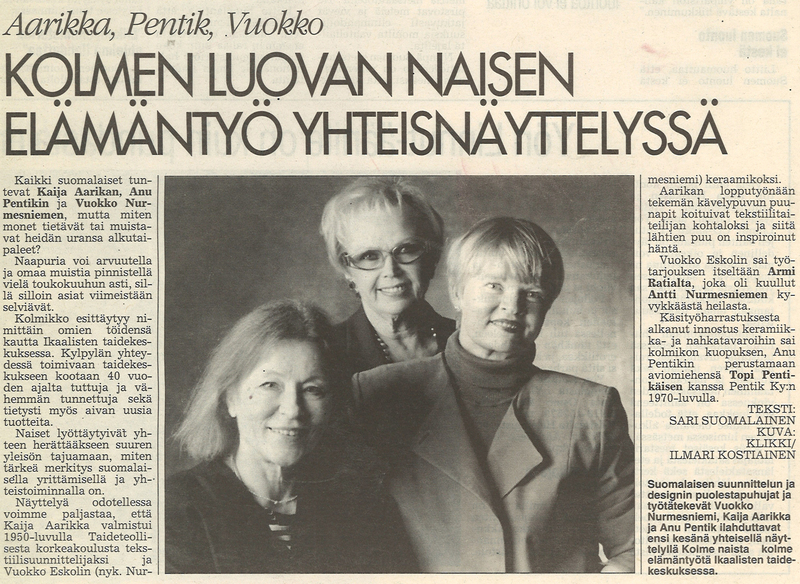 Turun Sanomat, 16 January 1999. 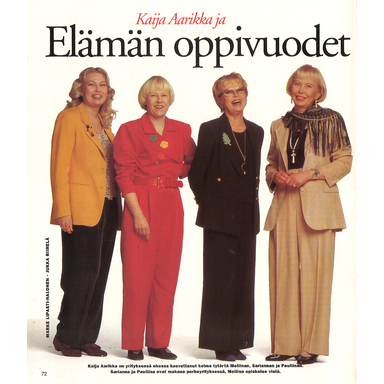 To celebrate Aarikka’s 40th birthday, Kaj Kalin wrote a history of Aarikka, and a jubilee exhibition was held at the Design Museum in Helsinki. 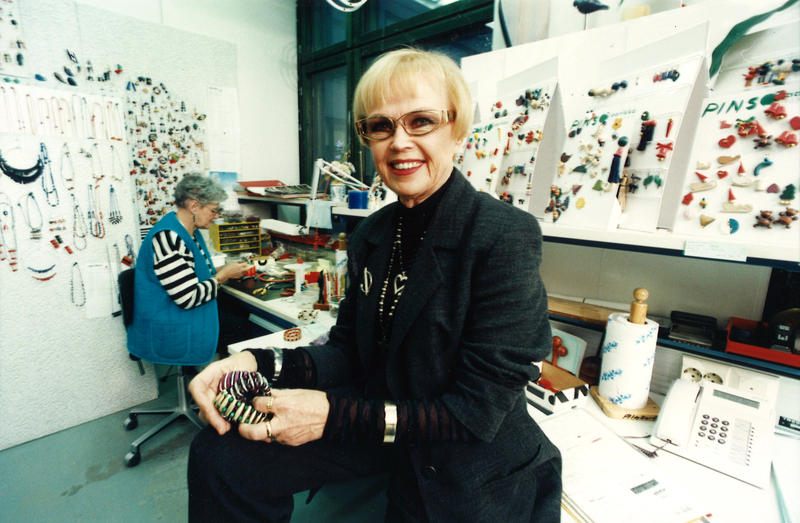 Glass artist Markku Salo, interior-design architect Tuula Falk, jewellery designer Aino Faven, and fashion designer Jukka Rintala all participated in the exhibition. It also displayed the large wooden trays and plates designed by Pauliina Aarikka that follow the lines of traditional clay dishes. From Helsinki, the exhibition continued its journey to Oslo and Tokyo. The 45-year exhibition was held at the House of Nobility in Helsinki. 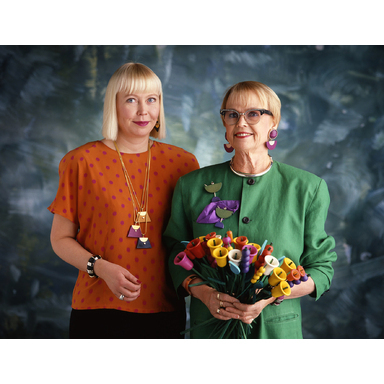 To commemorate the jubilee year, Kaija and Pauliina Aarikka and Jukka Rintala designed special collections of silver jewellery. 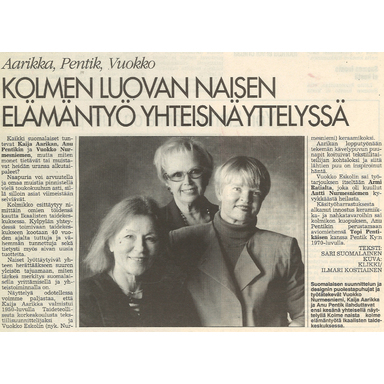 Kaija’s life work was also exhibited in an exhibition titled ‘Kolme naista – Kolme elämäntyötä’ (meaning ‘Three women, three life works’), alongside the output of Vuokko Nurmesniemi and Anu Pentik.